For the last few Mondays I have found myself writing a post about the best little bits of my past week. I didn't consciously decide to do this, somehow it just happened. I have decided that I really like it. I enjoy focusing on the bright spots in what can otherwise seem to be a bit of a dreary week. So for this week here are the things that made me happy. 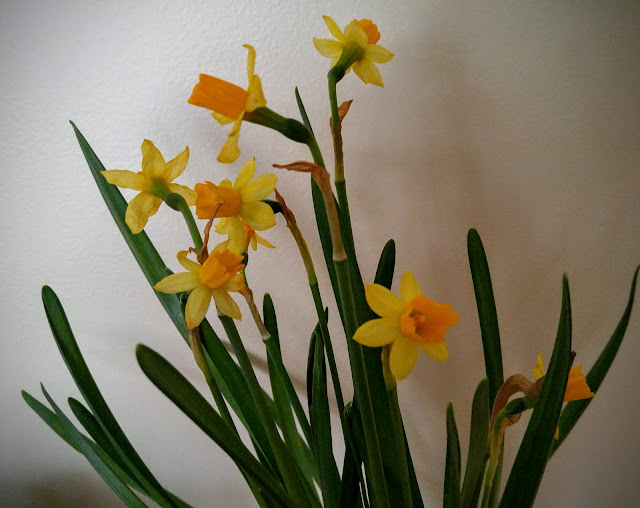 I love these mini daffodils that I bought at the grocery store for a couple of dollars. They grew like mad and flowered like crazy and they make me smile every time I look at them. Plus, they came in a bright yellow little pot. What more can you ask for? I had one more book come in the mail. 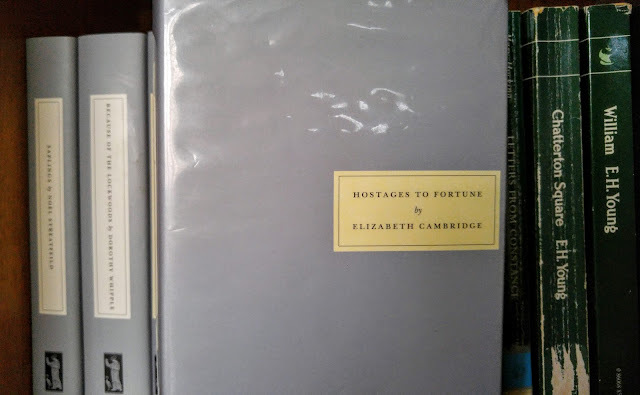 It was another secondhand Persephone, Hostages to Fortune by Elizabeth Cambridge. It is described as a domestic novel, the story of a young couple and their three children living their lives in a small village in Oxfordshire. The description says it is a novel where not much happens. That is my favorite kind of novel. I can't wait to read this. It has an annoying plastic cover on it since it was an old library book. I will have to see if I can remove that. My new camera was delivered. With my usual unreasonable determination to master everything at once, I dove right in and tried to figure it out completely. That didn't work too well. Apparently, you can't learn how to work a camera on manual settings overnight. I have now scaled back my expectations and decided, like a reasonable person, to learn the basics first and then move on. And, like any book lover learning a new skill, I have decided I need a book for that. So tomorrow I am going to stop in at Barnes & Noble and find a book on photography. In about ten years you should see some gorgeous photographs on this blog. Actually, I really like the camera and I will have fun playing around with it. Last week I found out that Bletchley Park, the center for codebreaking during WWII, is an easy day trip from London. I spent a happy morning planning an itinerary and looking at pictures online. With my fascination with Britain during WWII, this is the ideal day out. Discovering that this day trip was doable made me very happy. Thank goodness my husband thinks it sounds interesting too because I gave him no choice in the matter and just informed him that we were going. In a little over two weeks we will be in London. I couldn't possibly be more excited. Daffodils are my favorite flower! Then you must love spring with all the daffodils blooming everywhere. They are such a cheerful flower, aren't they? I can't wait either and I am sure I will write multiple blog posts about what we do. It's nice to know at least one person will be happy to read them! Daffodils are like little blobs of sunshine. Cheerful and joyous and friendly. I plant more of them every year! Your description of daffodils sounds like something Anne Shirley would say!